Uvonair UV-80H is an economical air purifier that produces ozone using special ultra violet light bulbs. Ideal for rooms up to 5000-10000 cu.ft. (150-300m3). 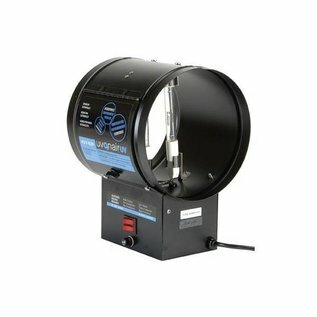 Uvonair UV-80H is an economical system that produces ozone using special ultra violet light bulbs. Ideal for rooms up to 5000-10000 cu.ft. (150-300m3). Fits 8" (20 cm) ducts but can be installed into other size ducts using adapters. For larger areas use a Uvonair CD model.